Pierre Bonnard (French, 1867-1947), The Bath, 1942. Gouache, pastel and colored crayon on paper, 19 3/4 x 25 5/8 in. (50.2 x 65.4 cm). Signed lower right. NEW YORK, NY.- Jill Newhouse Gallery is presenting a selection of paintings, drawings, and watercolors by Pierre Bonnard together with works by contemporary artists who have absorbed his influence, including Graham Nickson, Larry Poons, Cecily Kahn, Julian Hatton, Rachel Rickert and Jackie Saccoccio. On view are 23 works by Bonnard of all periods: a small early painting of Marthe (1905) walking down a Paris street, 2 fully colored landscapes in watercolor and gouache from the 1920s, numerous pencil drawings of figures, still lifes and landscapes of France and Italy, culminating in 2 iconic depictions of Marthe in the bathtub- a large complete pencil drawing of 1936 and a richly colored large scale gouache done in 1942. Also the inspiration for a show by Damien Hirst at Gagosian Galleries, the artwork of Pierre Bonnard has influenced generations of painters who admire his devotion to color and the way he applied it to canvas. Bonnards choice of subject matter, banal scenes from his own daily life, are rich with implied meanings and suggestive narratives depicted in a rainbow assortment of primary colors. In his drawings, Bonnards rapid economic line activates the page in unique ways, by using dots and dashes and squiggles. Bonnard was a constant draughtsman and relied on his drawings to create his painted compositions. In fact photos of the artist at work show drawings pinned up on the wall around an unstretched canvas still in progress. Graham Nickson is a well known figurative painter who is also head of the New York Studio School. Larry Poons has been painting abstractly since the 1960s when his floating elliptical shapes became well known. 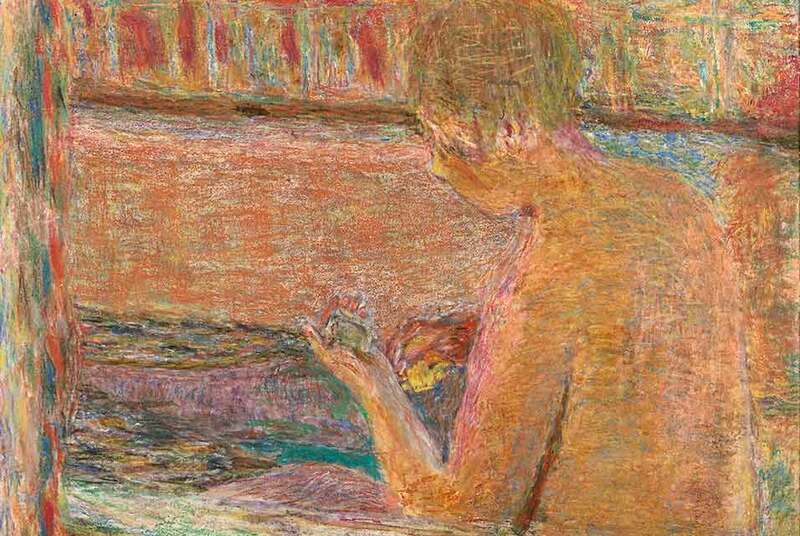 Cecily Kahn, Julian Hatton and Jackie Saccoccio have responded with abstraction to Bonnards vibrant colors, while Rachel Rickert, the youngest artist, has taken Bonnards bathers as her inspiration.